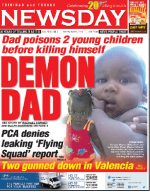 Published on April 27, 2014 in General T&T, Race and Identity and Racism Watch. 14 Comments Tags: Abuse, Racism, Raffique Shah. As we grapple with divisive elements in the society that seem to thrive on fomenting mistrust between our two main ethnic groups, I take comfort in the fact that for the vast majority of our people, especially the young, racialism and racism have little space in Trinidad and Tobago.